Do you remember the top radio hit from your high school years? Or the song you always used to pick on the jukebox with your friends? Perhaps there’s a piece of music you turn to for moments of quiet contemplation— a favorite symphony or album. It could be a guilty pleasure or a song you think is a work of genius. Whatever your most memorable songs are, you’d be surprised the big affect they can have. Because music stimulates so many different parts of the brain, music therapy for dementia patients can be more effective at helping for those in need of memory assistance to access memories and make neural connections that are otherwise difficult or out of reach. Anecdotal evidence shows seniors dancing, laughing, singing, and responding to songs they listened to in their youth. One famous YouTube video shows an elderly gentleman who had difficult recognizing his family members giving detailed responses to questions about a song he was listening to, about why he liked it, his knowledge of the performer, and similar music he liked when he first heard the artist. One researcher at the VA Medical Center in Bedford, Massachusetts showed that music is so effective on those with memory disorders in part because of what areas of the brain are effected. Alzheimers affects medial temporal lobes, including the hippocampus, first, but auditory processing centers like the cortical and subcortical sections of the brain are often left unaffected. Because those sections are connecting to the rest of the neural network, however, music retains its ability to enliven the whole brain, even parts that are affected by dementia and Alzheimer’s. 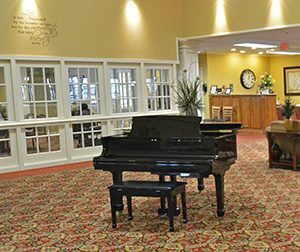 Many senior residences and memory care facilities seek to stimulate seniors cognition in similar ways, not only through music, but through environmental design that simulates old soda counters and other youth hangouts that are deeply embedded in their sense memory. Familiarity is crucial for those with memory disorders, who are easily overwhelmed by too many sights and sounds. It’s easiest to interact one-on-one in quiet environments to help preventing those with Alzheimer’s from becoming frustrated or overwhelmed from too much sensory input. The structure of music can ease the discomfort from processing chaotic environments by offering drum beats, choruses, harmonies, and rhymes that are not only pleasurable to hear but invoke fond sensory and long-term memories. Not only is listening to music beneficial, so can be dancing, movement, conversation around it, or simply rocking, holding hands, and other passive touching during the song. Above all Alzheimer’s and dementia patients crave intimacy, friendship, and contact, as do all human beings. Though their cognitive impairments may make traditional contact difficult or frustrating, a little creativity and understanding on the part of friends, family, and care-givers can go a long way to bridge the gap. Music can make this easier for both parties, creating common ground and a point of conversation. Other resources that can make care-giving for loved ones with memory impairments easier include The Alzheimer’s Caregiver Buddy, which teaches how to deal with wandering, as well as routines that may be complicated by memory disorders such as meal times, hygiene, and medication schedules. It provides live help 24 hours a day by clicking and calling the Alzheimer’s Association toll-free 24-hour helpline at 1-800- 272-3900.